Lenoir City – Offering comprehensive inpatient and outpatient therapy services. Loudon – Offering outpatient therapy. 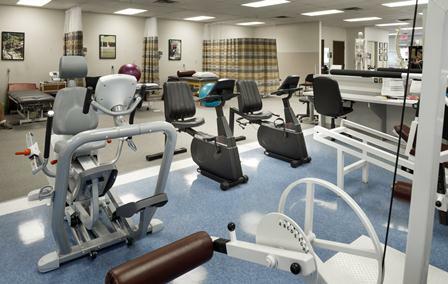 We are pleased to offer persons recovering from illness, injury or surgery full rehabilitation services at the Fort Loudoun Therapy Centers. These services are available close to home for citizens of Loudon, Monroe and surrounding counties. Fort Loudoun Therapy Centers are located in Lenoir City (adjacent to the hospital) and in Loudon. They provide comprehensive physical as well as occupational and speech rehabilitation. Like Fort Loudoun Medical Center, these facilities are also members of Covenant Health. Fort Loudoun Therapy Center Lenoir City Clinic now offers LSVT BIG & LOUD therapy treatment for patients with Parkinson’s Disease. These programs are designed to improve movement and range of motion, improve vocal loudness and speech intelligibility, increase facial expression and improve confidence . For more information on this program click here. As a physical therapist and the manager of Fort Loudoun Medical Center’s Therapy Centers, Pam is passionate about helping people and views her career as a personal mission field. She upholds a standard of excellence through education, in which she continually educates herself and her staff with the most recent physical therapy research so that they can provide excellent care to their patients. When not working, Pam can be found enjoying the great outdoors.